For the past three years, the Centers for Medicare & Medicaid Services (CMS) has been partnering with seven organizations to implement strategies to reduce avoidable hospitalizations for Medicare-Medicaid enrollees who are long-stay residents of nursing facilities. This work, the Initiative to Reduce Avoidable Hospitalizations among Nursing Facility Residents, is a result of collaboration between the Medicare-Medicaid Coordination Office and the Center for Medicare and Medicaid Innovation. The Initiative directly supports CMS’ ongoing work to reduce avoidable hospitalizations for Medicare-Medicaid enrollees and improve quality of care in post-acute and long-term care settings. To launch the second phase of this initiative, CMS is announcing a new funding opportunity that will allow currently participating organizations to apply to test whether a new payment model for nursing facilities and practitioners will further reduce avoidable hospitalizations, lower combined Medicare and Medicaid spending, and improve the quality of care received by long-stay nursing facility residents. Improving the care experience for individuals who are Medicare-Medicaid enrollees – sometimes referred to as “dual eligibles” – is a critical priority for CMS. Currently, Medicare-Medicaid enrollees navigate multiple sets of rules, benefits, and providers (Medicare Parts A, B, and D and Medicaid). Total annual spending for their care is approximately $300 billion across both programs. Medicare-Medicaid enrollees are among the most chronically ill and complex enrollees in both programs. Hospitalizations can be disruptive and costly for Medicare-Medicaid enrollees residing in nursing facilities. Research shows that nearly 45 percent of hospitalizations among this population are avoidable, meaning they could have been prevented or treated in a lower intensity care setting. Promote better care at lower costs while preserving access to beneficiary care and providers. Seven organizations selected to participate in the initiative are partnering with CMS to implement evidence-based interventions to accomplish these goals among Medicare-Medicaid enrollees who are residents of long-term care facilities (see Appendix A). Each Enhanced Care and Coordination Provider (ECCP) provides on-site services in its partner nursing facilities, including direct care and staff training. 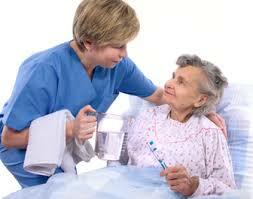 Nursing facility participation is voluntary. The awarded interventions in the first phase of the initiative have reached about 16,000 beneficiaries each month. Successful ECCP applicants would be able to continue these interventions in conjunction with the new payment model. In July 2015, CMS released a report entitled, "Evaluation of the Initiative to Reduce Avoidable Hospitalizations among Nursing Facility Residents: Summary of Evaluation as of December 2014." This summary report presents results of the quantitative and qualitative analysis of data from the first Initiative year, 2013. The intent of the new payment model is to reduce potentially-avoidable hospitalizations by funding higher-intensity interventions in nursing facilities for residents who may otherwise be hospitalized upon an acute change in condition. Improving the capacity of nursing facilities to treat medical conditions as effectively as possible on-site has the potential to improve the residents’ care experience at lower cost than a hospital admission. The model also includes payments to practitioners (i.e., physicians, nurse practitioners and physician assistants) that are similar to the payments they would receive for treating beneficiaries in a hospital. Practitioners would also receive new payments for engagement in multidisciplinary care planning activities. Successful ECCP applicants would implement the payment model with both their existing partner facilities, where they provide training and clinical interventions, and in a comparable number of newly recruited facilities. The payment model is slated to run from October 2016 to October 2020.